Natural swimming pools have been popular in Europe for years, but are now starting to make a splash in the United States and grow in popularity quickly. They are a fantastic nature-based sustainable and chemical-free alternative to traditional and mass manufactured pools. Literally ‘green’ pools are kept healthy by developing their own plant-based ecosystem while creating a beautiful landscape feature for your garden at the same time. The plants and their careful aeration process bad bacteria and keep the pool looking clear, clean and healthy. Various plant habitats are planted in different zones of the pool. These plants typically include; rushes, water lilies, and sedges. 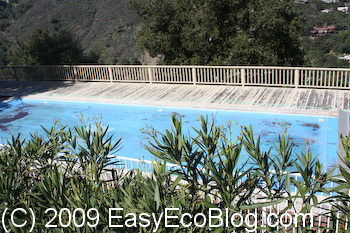 Swimming pool pumps use a ton of electricity. It is estimated that they use up a shockingly high percentage of all residential power and use almost 1500 kWh of power each year. Spa pumps and heaters use up to 2250 kWh of energy every year. 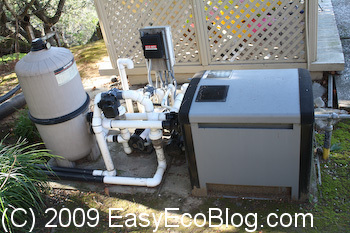 The pool pump uses most of the power, so finding energy efficient pool pumps is very important. It pushes water through filtration units and has not changed in many years. New variable speed pool pumps are now available. They are energy efficient and are quieter by running motors slower, but run for longer periods of time.